Sam Fattal, a controversial Montreal landlord with a long history of run-ins with the city of Westmount, has been branded a "vexatious litigant" by the Quebec Superior Court, according to a judgment issued last month. The ruling prohibits Fattal from suing the city of Westmount or its employees without the prior approval of a Quebec judge. 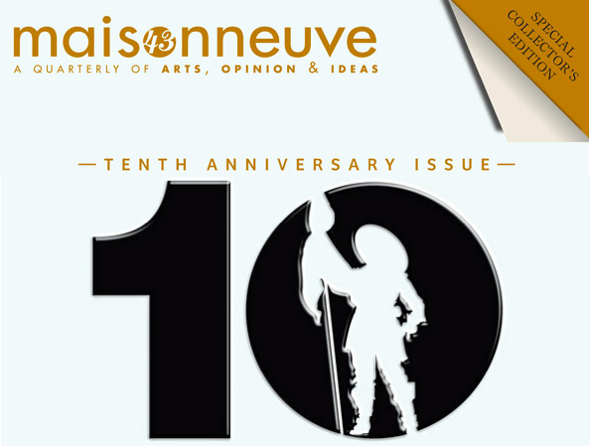 "Like our hometown, this magazine is an energetic, frustrating work in progress, the product of little triumphs and hard struggles," - Maisonneuve Staff. Like our hometown, and also like a lot of the authors, poets, and musicians who will read and/or perform at Maisy's 10th anniversary launch party at the Eastern Block this Thursday. For $7 you get to read about a young Arcade Fire losing a battle of the bands, Quebec's obsession with Iron Maiden, and tone deafness as investigated by a tone-deaf music lover. But wait! There's more! Indie idol, Lief Vollebekk, Governor General Award-winning author, Kathleen Winter; and MTL International Poetry Prize long-listed Lizy Mostowski will be there too. It would be nice to take a vote on what people think is the most effective way to instigate policy change: blocking an autoroute or overturning a police car. My vote would go to the above individual, a self-proclaimed squeegee, who attacked a would-be vandal from smashing the windows of a downtown boutique. He reportedly screamed, "Cette boutique n'a rien à voir avec notre cause! Je suis squeegee, les gens qui viennent magasiner ici, c'est ma business de tous les jours! Allez manifester!" Good on him. 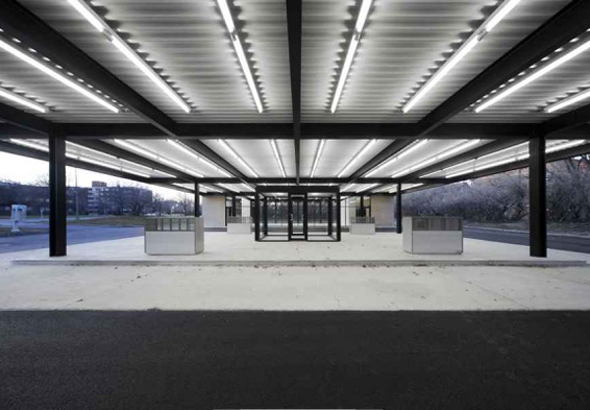 A few years back my boss, in a flurry of excitement, drove me out to Nun's Island (which definitely needs a new access point) to check out the remains of a gas station designed by famed architect, Mies van der Rohe. We parked, let his dog out, and circled the boarded up building a few times. It was nothing too impressive, but one had to imagine back to 1962 during its unveiling - Mies also designed Westmount Square around that time. We left a few minutes later, having let the dog do his business around back. By now you've probably seen the image above plastered in your facebook feeds, your campus dailies, or your other local news sources. You may have even seen it on the t-shirts of activists, protesters or those who stand in solidarity against what happened on McGill's campus last week, where riot police were called in to break up a demonstration/occupation and otherwise peaceful protest. The image is so virally affecting because of the power disparity between the two sides. The police with their hard armour, helmets and shields look ready to take out a herd of rhinos. The students look ready to take out library books. Power favours those with the means to enforce it. At first, my friend Vivian was a little startled by the loudness of my voice. "Education is a right! We will not give up the fight!" I turned to her and smiled. "I'ma lose my voice today." For the next chant, though, she was just as loud, and as the march of McGill and Concordia students wound its way towards Berri, our voices became bolder, louder, and, eventually, Frencher. Like about 25,000 others, she and I took to the streets on November 10th to protest the provincial government's decision to raise university tuition, which most estimates suggest will prevent 7,000 students from attending university. 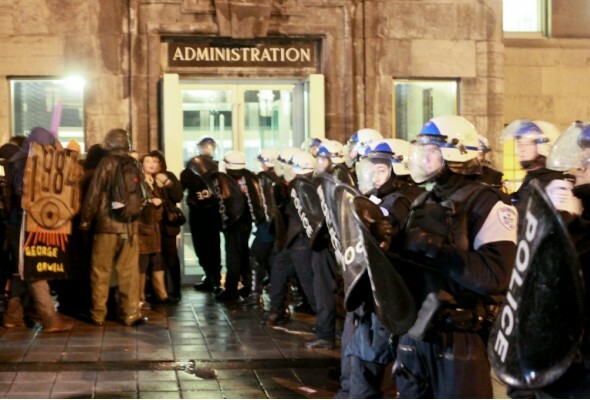 The mood was high despite the rain, the students noisy and creative, and the SPVM remarkably restrained. 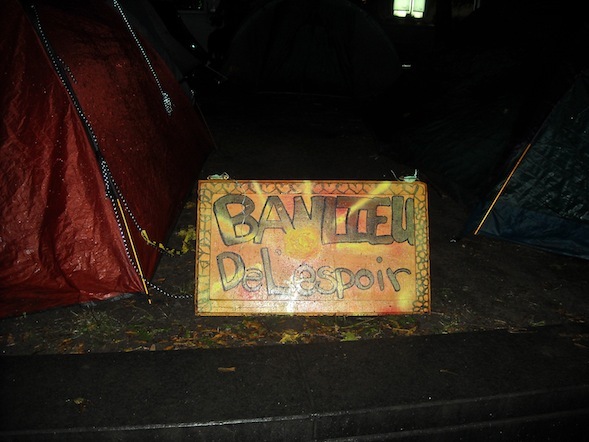 As the march came to its ending point (Charest's office, conveniently across the street from McGill's Roddick Gates), a girl shouted that some students had occupied the fifth floor of McGill's James Administration building . "They need help!" Jeudi, 16 h. Un orage violent aux airs de déluge frappe le centre-ville de Montréal. Une pensée me vient pour les indignés. Les irréductibles campeurs sauront-ils tenir bon face aux éléments ?